"A World of Mystery and Wonder! " Dylan’s gap year is going great, yes her cruise ship was sunk by some sort of ancient evil sea monster and she had to spent a lot of time nearly starving to death. But she’s doing better now she lives in a world of mystery and wonder! In The Pirate Continent! She made new friends and is only almost killed now by Vikings and every once a while Nazis. Adventures in the Pirate Continent has not been tagged yet. Help others find Adventures in the Pirate Continent by tagging it! 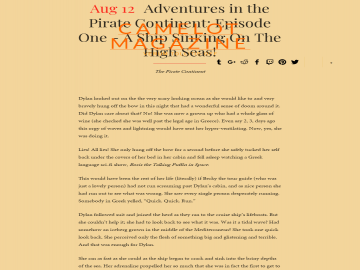 Adventures in the Pirate Continent has not been reviewed yet. Adventures in the Pirate Continent has not been recommended yet.